We asked VO customers what width the next model of VO hammered fenders should be, and 37mm was the overwhelming choice. They just arrived. The pattern is a little different from our 45mm hammereds; the indentations are smaller and the there is a smooth band at each side. We think it's a cool look that's a little sportier than the Honjo 35mm that we also stock. We recommend using them with 20-28mm tires, 700c. I came back from vacation to find that the new Gran Compe 610 brakes had arrived. The new 610s are super stiff CNC machined centerpulls with 47 to 61mm reach. I'm really excited about these. Top of the line centerpulls generally have better stopping power than sidepulls, but what is more important is that they tend to have better modulation. That is, the brake pressure is more linear and controllable. Paul Racers have long been the only other high quality centerpulls available and we used to sell them. But at $133 per wheel, or $143 for the high polish version, they are simply too expensive for most. Fortunately the Gran Compe 610 are only $75. Note that the version we sell have been upgraded with VO alloy cartridge brake shoes and VO pads. This makes adjusting toe-in easy and any Shimano-type pads fit. It was really nice of the folks at Dia Compe to accommodate us in this since they also make their own brake pads. Another neat thing about these brakes is they fit frames made for either recessed or nutted brake bolts. Two bolt spacers are included to allow them to fit most older frames, as well as modern frames. 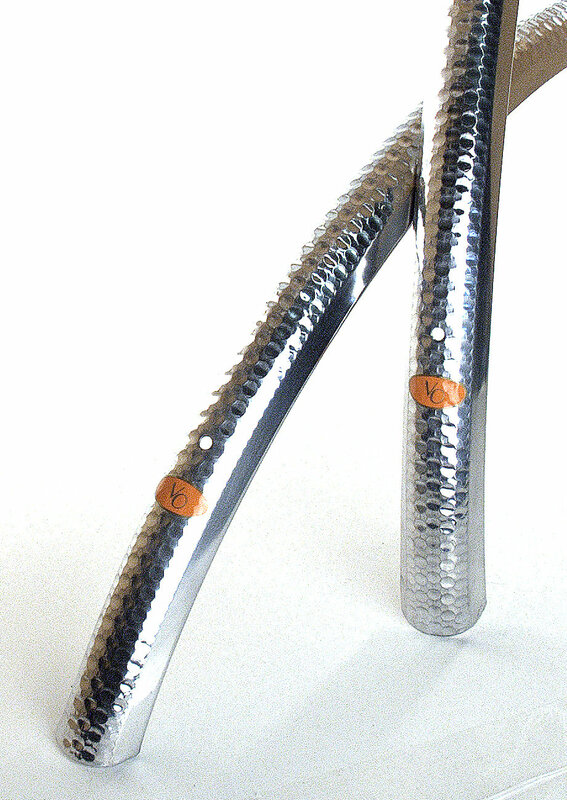 We are trying to convince Dia Compe to also offer braze-on mounts for custom frames. The front mini-racks for the 610s are on the way. These are neat little racks just big enough to support a handlebar bag. They just arrived in the US and should clear customs in a week or so. Just wanted to let you know that there will be little, if any, blog activity for the next few weeks. Annette and I are leaving for vacation tomorrow. I'm traveling sans laptop, taking only an iPad which I might turn on for a few minutes a day. So please excuse if I don't return e-mails or post or tweet for a while. Info e-mails will still be answered by the staff. Meanwhile, Tom is visiting VO distributors in Britain and will be soon be heading to Spain for a little well deserved R-and-R.
Kyle is finishing up grad school over the summer, so is only working part time. And Heidi is taking her 16-year old son to California for a summer-long Olympic sailing clinic; he's been asked to try out for the 2012 US sailing team in Finn class. But orders will get out promptly as always. Perry is acting general manager and the full warehouse staff, less Heidi, is present. King Trygve is cleaning up the glitches on the new web site while Kyle attends to final design details. Robert will be building up wheels to test the new hubs and the new VO Raid rims (they are 22mm triple box section rims that look like wider PBP rims). The photo is of our VO freewheel hub. They use high quality Japanese bearings. The spoke holes on the drive side are slotted so broken spokes can be easily replaced with the freewheel in place, but we are still doing strength testing on this feature. We hope to have them for sale early this fall in 126mm and 130mm spacing. 120mm spacing is also possible if there is demand. The VO flip-flop hub prototypes are also here, but the design is undergoing some cosmetic modifications that may require a bit of new tooling, so no ETA yet. The pictured quick release is something we're still thinking about. Do you like it? The VO cassette hub is taking a little more time to develop than we thought. I doubt we'll have them finished before late fall. 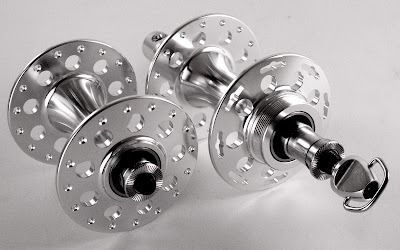 I recently mentioned a new dynamo hub design that I thought was revolutionary and might make existing high end dyno hubs obsolete. We have a production-ready sample that we'll be testing over the next few weeks. But I can already tell you that the build quality looks very impressive and, if my calculations are correct, it will cut overall rolling resistance by more than 50% compared to any other (production) dyno hub that I'm aware of, while maintaining the same 3w/6v output. If all goes well we should have them in around 3 months. The cost will be considerably lower than existing high-end dyno hubs. We do want to be clear that this is not technology developed by VO (we're not that smart), but from a small company we ran into almost by accident. I'm sure that you have questions about them, but those are all the specs we'll reveal for now; sorry. I know that a lot of you have been waiting for the Grand Cru 50.4bcd cranks. I had thought they would be here by now, but the factory has had some delays in testing the new tooling. Also, factory offices moved to a new location which slowed things down. In any case, the latest estimate is that they will be done about July 25th. We'll have a few hundred shipped by air and the rest by sea. 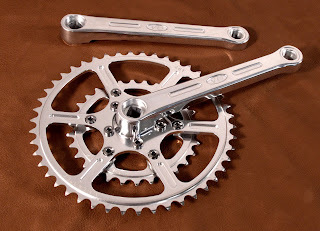 Details on these cranks can be found at this post. The VO 110bcd cranks should be done a few weeks later. 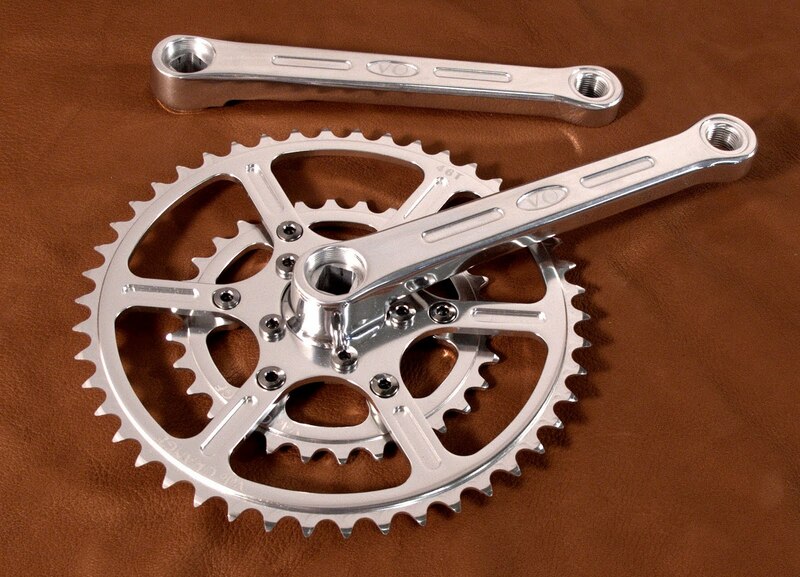 We still don't have a firm ETA on the Grand Cru 110bcd cranks, but they are in production. We've had some major delays in getting other products here on time because of new packaging. As we sell to more and more shops all over the world we find we need more refined retail packaging. And having those boxes and tags and backing cards made has been a real bottleneck. I would really prefer to have minimal packaging, just a poly bag and header card, but shops displaying VO products are asking for packaging that's more like Campy's and Shimano's. I do apologize for being out of so many items. The super busy spring season really cleaned us out and we've once again seen growth beyond what I'd anticipated and planned for. The good news is that we should have two containers of products, including several new items, sailing in July.